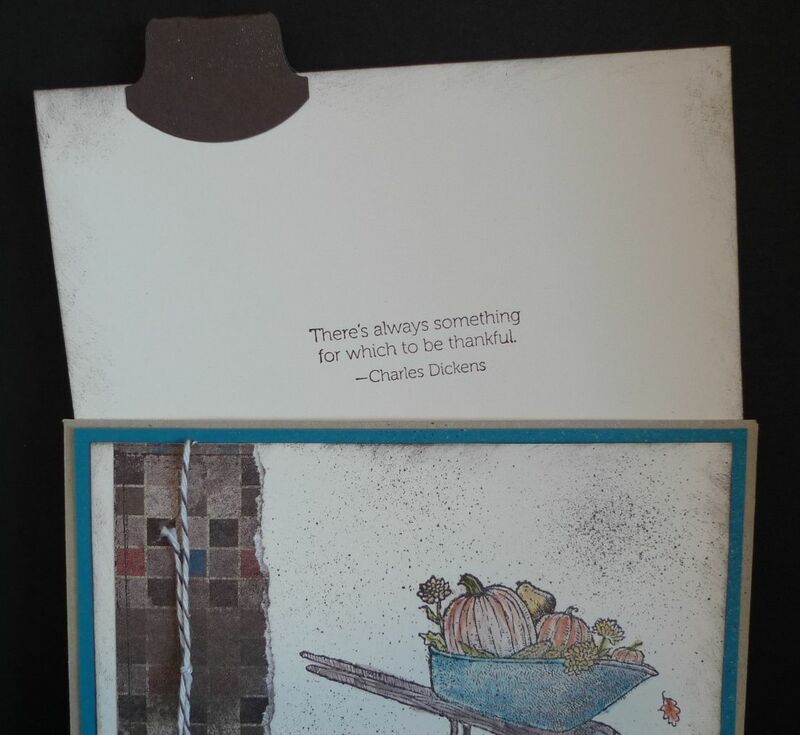 I have another Always Thankful card to share with you. This one has a bit of a twist. I used a kraft envelope for the base of the card and tucked the flap inside the envelope to create a pocket. I got this idea from convention. Step 1: Tuck in the envelope flap inside the envelope. Set Aside. Step 2: Stamp “There’s always something for which to be thankful” in Early Espresso ink on Very Vanilla card stock (5-1/2” x 4-1/4”). Sponge the edge with Early Espresso ink. Fold the round tab punched piece in half and attach to the card stock. Tuck inside the envelope. Step 3: Stamp the wheelbarrow image on Very Vanilla card stock in Early Espresso ink. Color in the image with a blender pen and Early Espresso, Island Indigo. Cajun Craze, More Mustard & Basic Gray Classic Ink. Sponge the edge with Early Espresso ink. Step 4: Attach Well Worn Designer paper to Very Vanilla card stock and tie Early Espresso Baker's Twine around the card stock. Attach to Island Indigo card stock. Step 5: Attach Island Indigo card stock to the envelope. 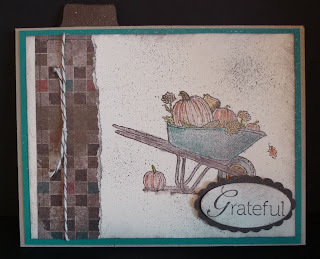 Step 6: Stamp "Grateful" in Early Espresso ink and punch out with the Large Oval Punch. Attach to Early Espresso Scalloped Oval. 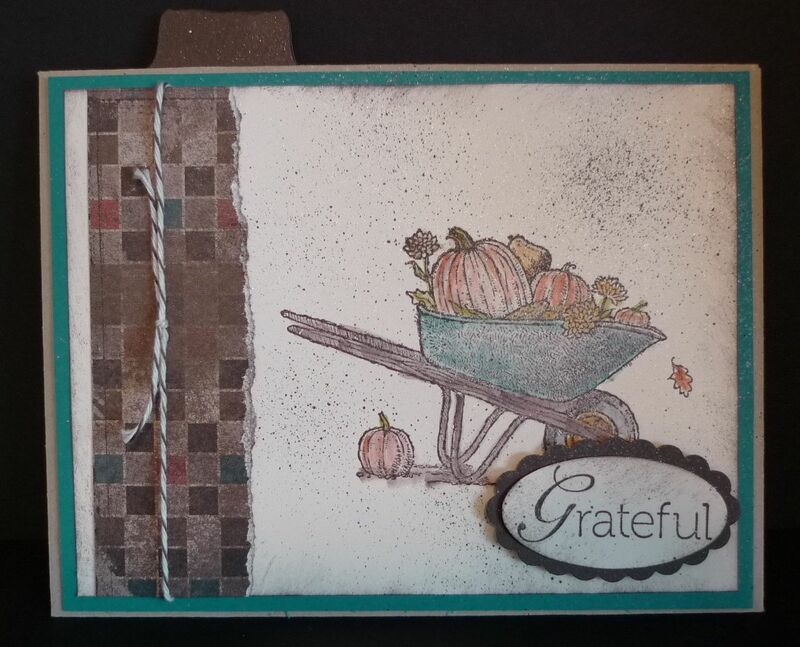 Attach to card with Stampin’ Dimensional. Step 7: Spritz card with Frost White Shimmer Paint and Rubbing Alcohol mixture. Spritz with Early Espresso Stampin’ Write Marker and the Color Spritzing tool.